Today is the first day of November and that means we are only a little more than a week away from the first daylong symposium on the Makino Collection at Columbia. 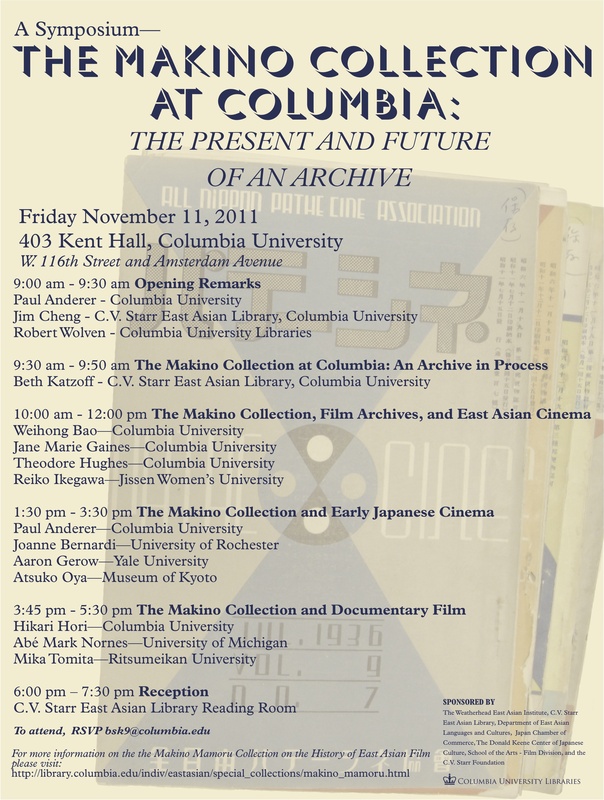 On 11/11/11, we will welcome 8 panelists, 3 discussants, and many visitors to 403 Kent Hall (EALAC Lounge) at Columbia University to hear presentations and discussions at the symposium, "The Makino Collection at Columbia: The Present and Future of an Archive." These include my overview of the archive in process and three panels. Eventually, papers and digital presentations will be added. Beth Katzoff, "The Makino Collection at Columbia: An Archive in Process"
"Paul Rotha/Poru Ruta and the Politics of Translation"
The symposium is sponsored by The Weatherhead East Asian Institute, the Japan Chamber of Commerce, the Department of East Asian Languages and Cultures, the C.V. Starr Foundation, C.V. Starr East Asian Library, the Donald Keene Center of Japanese Culture, and the School of the Arts-Film Division. This entry was posted in symposium and tagged archival processing, documentary film, East Asian Film, small gauge film, symposium on November 1, 2011 by Beth Katzoff.